The inspiration for this volume is one of the most celebrated documents retrieved from the ancient cave library in Dunhuang: a tantric commentary in 85 folios together with its root text, and prolific marginal annotations that are not found elsewhere. 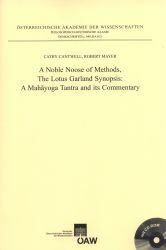 It provides our most reliable and comprehensive window into the ritual and doctrinal world of the early Nyingmapa. Among much else, it offers an unparalleled early representation of Padmasambhava, a detailed presentation of fundamental Nyingma tantric views later endorsed by Rongzom and Longchenpa, and citations attributed to numerous other Nyingma tantras. A good half of the book is devoted to editorial efforts, including a discussion of how they can be applied to Tibetan literature. The Dunhuang manuscript itself is shown to be defective in several respects, including accidental loss of chapters, while centuries of scribal mishaps have deprived the commentary as traditionally transmitted of a third of its contents. Even the root text has become distorted in most popular canonical editions. By collating all twenty-one extant witnesses drawn from Dunhuang, the Tenjurs, Kanjurs both mainstream and local, and the various Ancient Tantra Collections, stemmatic analysis establishes their sometimes unexpected historical relationships. Armed with that understanding, an accurate reconstruction of the contours of both texts becomes possible for the first time in many centuries, and numerous readings of the root text earlier even than the Dunhuang ms can be recovered. Cathy Cantwell and Robert Mayer together joined the Faculty of Oriental Studies, Oxford University, in 2002. Their particular interests include the Nyingma tantras and termas, Nyingma ritual, tantric texts from Dunhuang, and critical editing. They are the co-authors of a number of books, monographs and articles.